Shew… There are some GREAT books on this list. We listened when you said you wanted BOOKS, BOOKS, and more BOOKS to be a part of our giveaways. Of course, if I were savvy and hadn’t forgotten to do this post until late, I would have linked all of them, BUT I know you all are awesome and can look up each and every one of them for yourselves. I have to admit that I forgot because I was proofreading one of the above author’s (to remain nameless) newly completed manuscript. AND I loved it so much that everything else just poofed right out of my head. 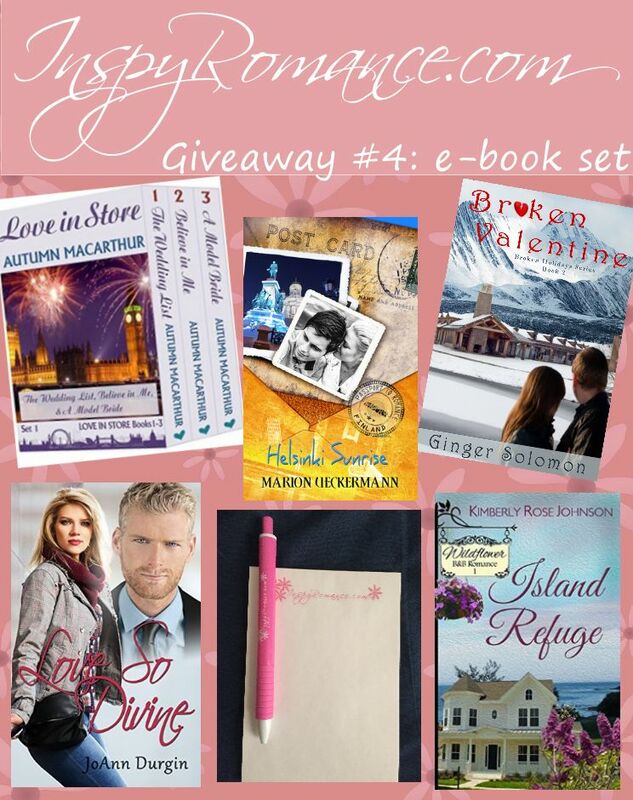 Linda Herold was the winner of Autumn Macarthur’s e-book giveaway. 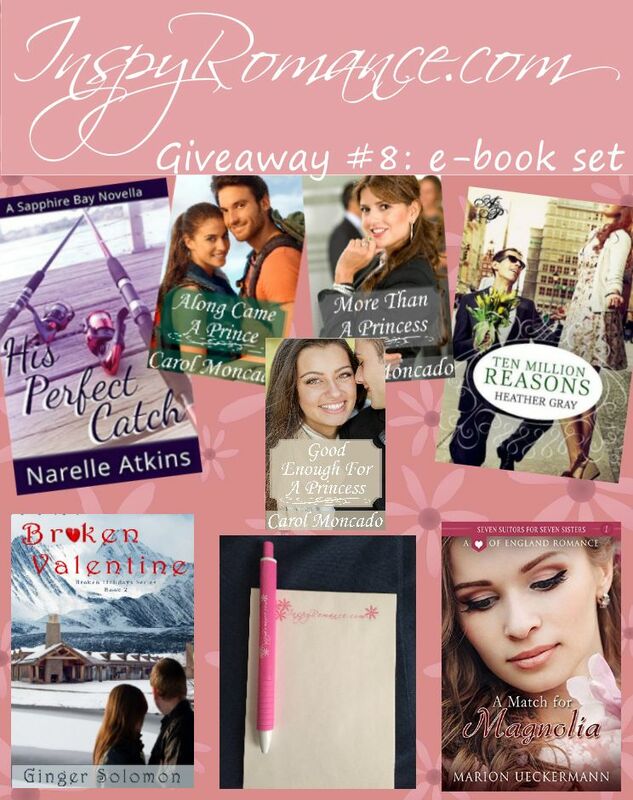 The winner of an e-copy of Love Blossoms by Narelle Atkins is Beth Gillihan. 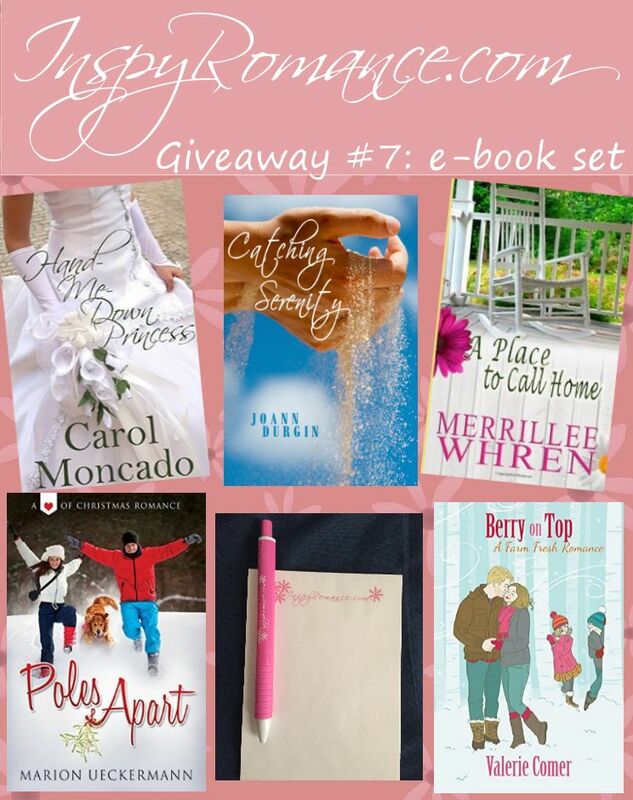 Thursday: Carol Moncado – Sneak Peek: Prince from her Past & #Giveaway! 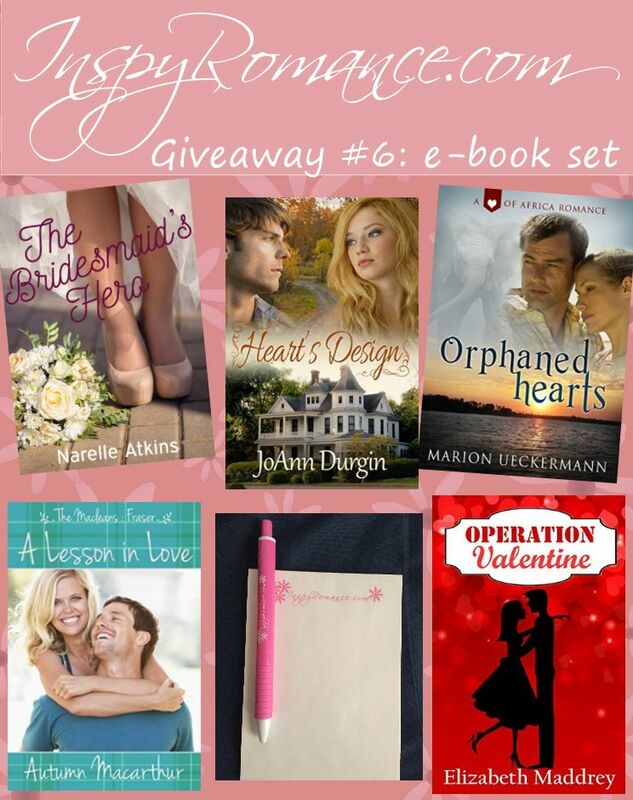 Saturday: Lee Tobin McClain – Valentine Quiz… and a gift card giveaway! A complete list of Inspy Romance books by our authors is always available on ourBOOKS tab! Check out box sets, permanently FREE books and audiobooks on our NEWS tab! On this day of love, it is only fitting to wish all you inspirational romance writer a blessed Valentine’s Day. 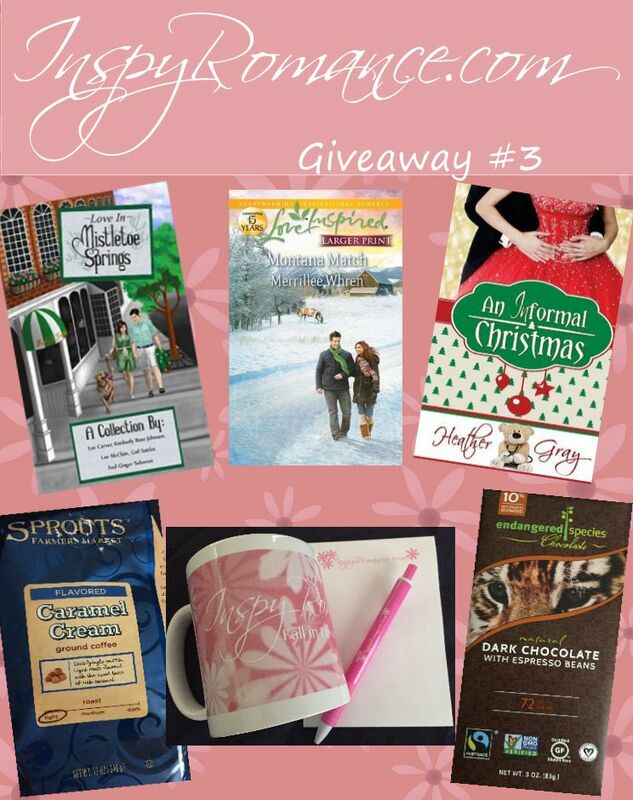 Thanks Ginger for enticing pictures of the eight wonderful give away packages. To all inspy romance writers, THANK YOU for your dedication in writer well edited and thought provoking, but still fun romances. It is a craft and your dedication shows. Another THANK YOU for the reasonable cost, promotions, boxed sets, and sometimes even free offers of your fine crafted inspirational romances. You are loved by your followers. HAPPY VALENTINE’S DAY! I’m glad we can help fulfill your need to read, Renate. READ ON! Happy Valentine’s Day! 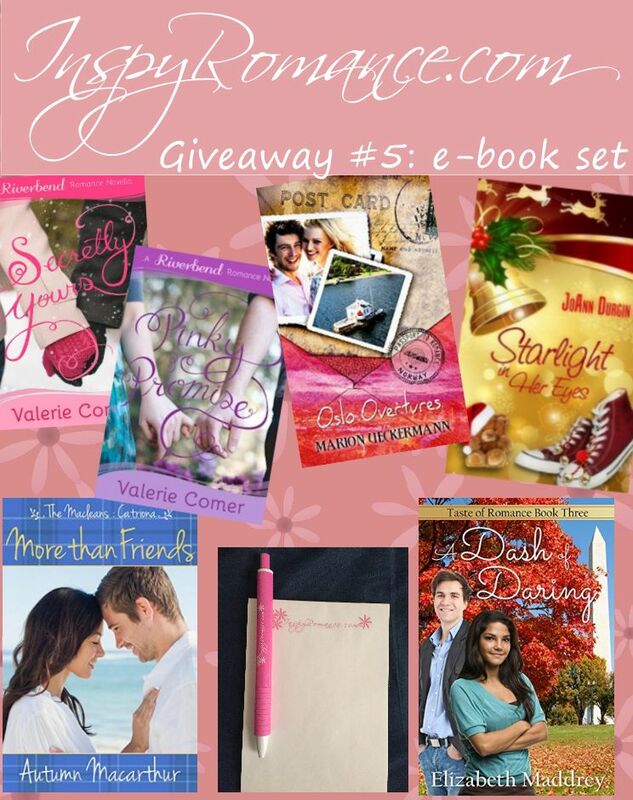 Love all the great Giveaways! 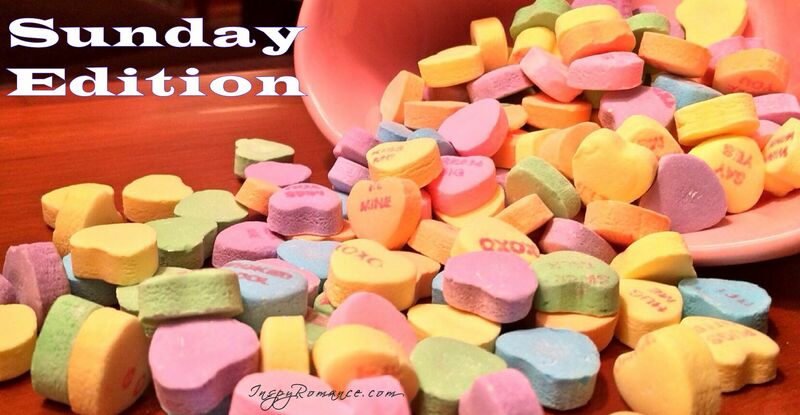 Thanks to all Inspy Romance writers for your dedication and your giving hearts. Enjoy your day! I don’t know if you meant to respond twice, but I will answer you twice. HAPPY VALENTINE’S DAY, Renate. No, I did not mean to post twice. But after I posted i was looking at your post on my iPad and my first post did not seem to have gone through (it was’t posted). After I posted the second, then both went through. There was no way to delete my second post. Thanks again for the great set of giveaways. Best wishes. 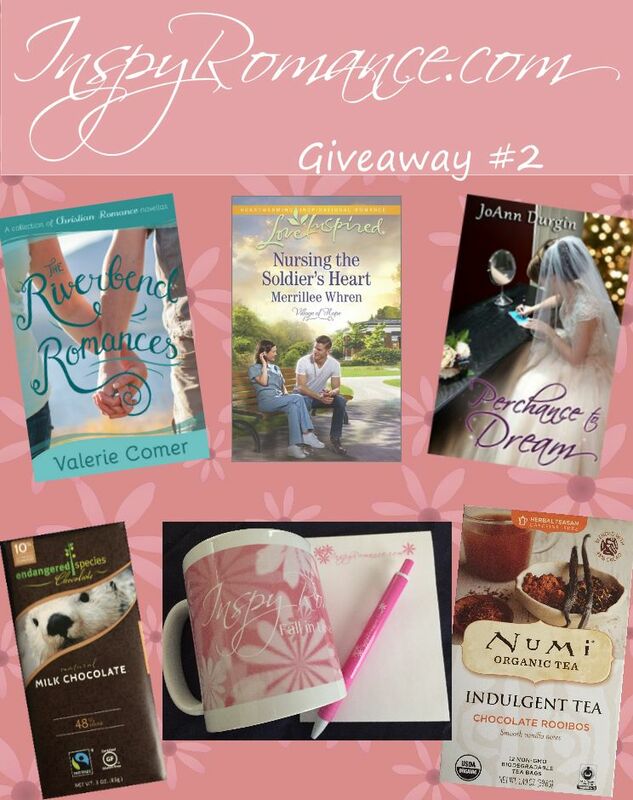 What wonderful giveaways! Thank you all for caring for the readers and giving such fantastic gifts! I enjoy reading about the authors and their stories. Happy Valentine’s Day to everyone! Thanks for stopping by, Melissa. Happy Valentine’s Day. WOW…what a GREAT collection of books for give always! These are all authors who God has blessed with a special talent! I hope everyone has a fantastic Valentine’s Day! You all are so wonderful and we love reading your books! I’m the same way, Marylin. God first, or I forget and get busy or interested in so many “good” things that I forget the BEST thing. Blessings. You’re welcome, Tammy. Don’t forget to come back and comment, starting tomorrow, for a chance to win. Happy Valentine’s Day to all of you great authors! You have such fun and awesome giveaways! Thanks, Jennifer. Happy Valentine’s Day. Great job on the lineup, Ginger! You’re welcome, Valerie, my dear, fearless leader, who wrangled… I mean coaxed… I mean asked me to take over this section of IR. :D And I am thankful. 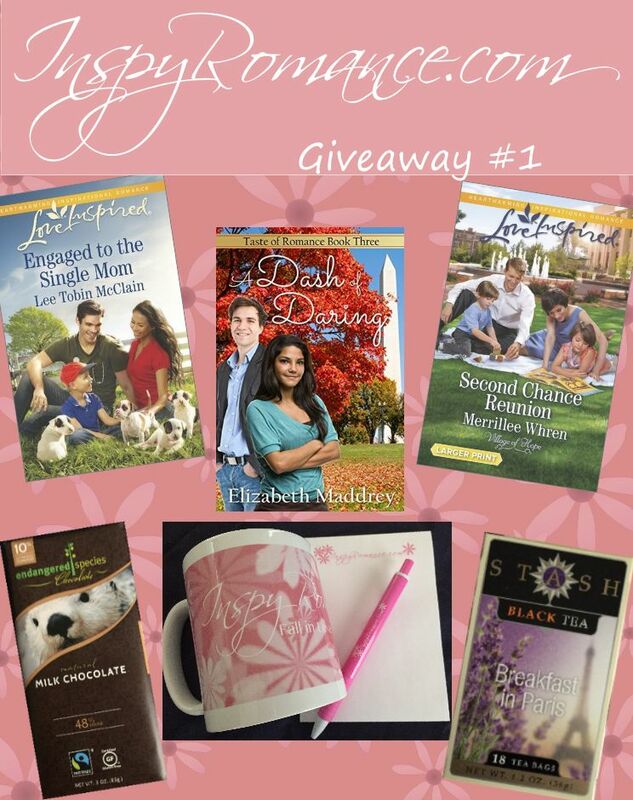 Andrea, Elizabeth’s right… To enter, comment from 2/15 to 3/14. The more you comment, the better your chances of winning. I should have added that. Great job, Ginger! Happy Valentine’s Day everyone! Happy Valentine’s Day. Thanks, Jill. Those are some serious prizes! Thanks to all of you ladies and Happy Valentine’s day! Happy Valentine’s Day. And our authors definitely came through this time. I love all the giveaways. Books,books and more books. We aim to please our readers, Linda. These are great giveaways. We can never have enough books! :) Thanks for all your hard work and for sharing with us! I agree, Winnie. Never enough books. EVER! Have a wonderful week, Trixi. Happy Valentine’s day Ginger. Awesome giveaways. I’ve read many of them but realized there are many I haven’t read! Thank you to everyone at Inspy Romance for the great stories and encouraging faith! Thanks, BTH (You don’t mind, do you?). We love to provide great stories and encourage you. Some great sets in the giveaways! I’m sure I would enjoy any of them. Thanks, Patty. A belated happy Valentine’s to you, too. Wonderful giveaways! You ladies are so generous. Thanks for all your posts and inspiring books. They all look amazing! There are going to be some very fortunate people.